Today, we've become accustomed to seeing images of the Earth's swirling atmosphere from space every night on the evening news. Before 1960, no one had ever seen such images. The first-ever weather satellite was launched that year, kicking off a long line of weather satellites that have kept a continuous watch on our planet's fickle atmosphere-45 years and counting! The high-quality, extended weather forecasts that these satellites make possible have become an indispensable part of our modern society, helping commercial aircraft, recreational boaters, and even military operations avoid unnecessary risk from hazardous weather. But satellites don't last forever. Parts wear out, radiation takes its toll, and atmospheric drag slowly pulls the satellite out of orbit. Many weather satellites have a design life of only 2 years, though often they can last 5 or 10 years, or more. A steady schedule of new satellite launches is needed to keep the weather report on the news each night. In May 2005, NASA successfully launched the latest in this long line of weather satellites. Dubbed NOAA-N at launch and renamed NOAA-18 once it reached orbit, this satellite will take over for the older satellite NOAA-16, which was launched in September 2000. "NOAA always keeps at least two satellites in low-Earth orbit, circling the poles 14 times each day," explains Wilfred E. Mazur, Polar Satellite Acquisition Manager, NOAA/NESDIS. "As Earth rotates, these satellites end up covering Earth's entire surface each day. In fact, with two satellites in orbit, NOAA covers each spot on the Earth four times each day, twice during the day and twice at night," Mazur says. By orbiting close to Earth (NOAA-18 is only 870 km above the ground), these "low-Earth orbit" satellites provide a detailed view of the weather. The other type of weather satellite, "geosynchronous," orbits much farther out at 35,786 km. At that altitude, geosynchronous satellites can keep a constant watch on whole continents, but without the kind of detail that NOAA-18 can provide. In particular, low-Earth orbiting satellites have the ability to use microwave radiometers to measure temperature and moisture in the atmosphere-two key measurements used for weather prediction that, for technical reasons, cannot be sensed by distant geosynchronous satellites. With NOAA-18 successfully placed in orbit, the 45-year legacy of high-tech weather forecasts that we're accustomed to will go on. 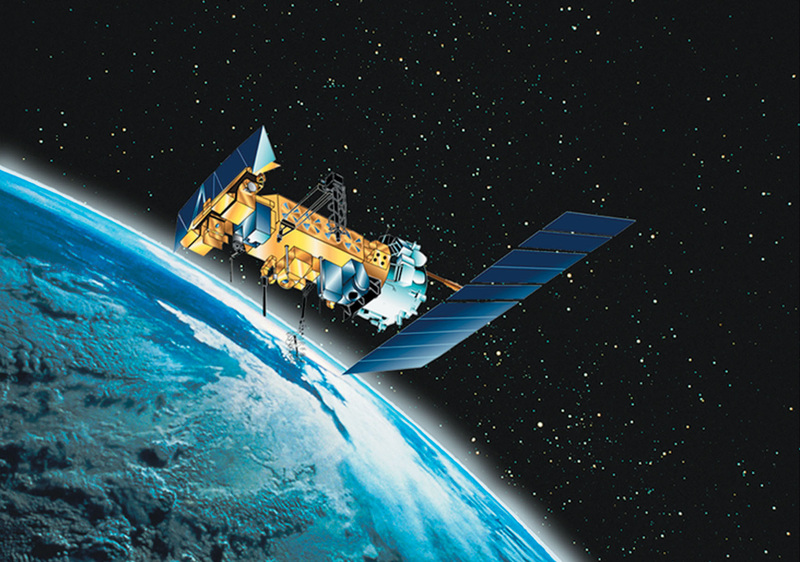 Find out more about NOAA-18 and the history of polar-orbiting weather satellites at http://goespoes.gsfc.nasa.gov. For kids and anyone else curious about the concept, the difference between polar and geosynchronous orbits is explained here .